Now marshmallow and hot chocolate go really well together but a Marshmallow Sofa? Designed by Irving Harper and George Nelson in 1956 this sofa as become an iconic piece of 20th design. The designers separated the elements of the sofa with a view to creating a pared down aesthetic. The 18 cushions mimic giant marshmallows which site on a steel frame. 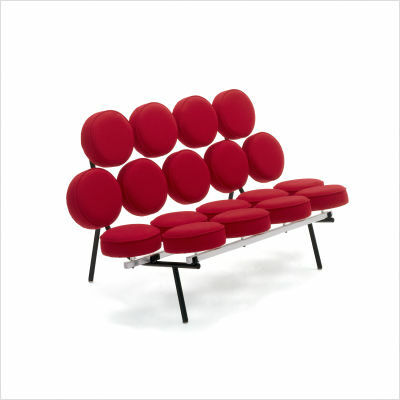 When the Marshmallow Sofa was manufactured in 1956, the Herman Miller catalog described it as “The first of a series of pieces embodying a new concept in soft seating. We feel that it has possible use not only in the home, but in contract use for lobbies in public buildings where the very fact that it is unusual will be a plus.” This sofa can really help to define the style of your room’s interior. I love the idea of using this sofa in a white room with simple, clean lines to give it a punch of color and a little fun. I also agree with the Herman Miller premise, that this sofa is great for both home interiors and commercial use. It is the ideal feature piece in a modern living room or even a mezzanine/large hallway and it will add stylish definition to commercial spaces large or small. The Marshmallow sofa is available in a large array of colors and fabrics, so not only can you choose something that will fit your vision, you can get lost in new possibilities. If you need more than one, particularly for a commercial space they don’t necessarily have to match – a contrast can be part of your design statement. The Marshmallow Sofa will not only provide seating but will give a room a focal point, add a sense of contemporary style to a living room or liven up a lobby or waiting room in a commercial space. The Marshmallow Sofa is available here in a large variety of colors and fabrics.